Check the preview for a good historical summary and a quick look at what’s in the box. This is my third Dragon Smart Kit, and I stand amazed once again. In fact, almost too amazed: this was one of the hardest kits I’ve ever assembled. Start with over 540 parts, throw in the dreaded photoetch and individual link tracks (Dragon’s “Magictracks”), and you have a case of advanced modeling syndrome just looking for a place to happen (in fact, it took me several months to finally complete this beast, and I had to slap the AMS out of myself). Not only is there super exterior detail, but this kit has a complete interior (a lot of which won’t show unless you open all the hatches). The instructions are quite detailed (19 separate assembly panels), but Dragon once again has a few mislabeled parts (e.g., G22 should be G25, P14 should be P15). My only other complaint is there is a dirth of painting instructions for the interior and the small equipment items inside the gun tub. 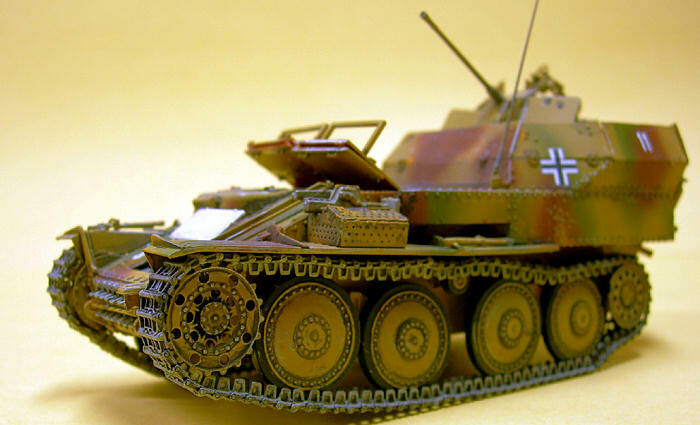 As always with these kits, I advise keeping a pencil close by and crossing off each part or subassembly to avoid confusion if you are like me and take a while to build a model like this. 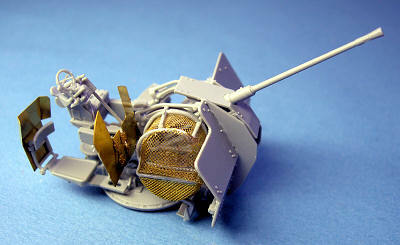 In addition, you will end up will a bunch of leftover parts that are for other Panzer 38(t) models. Per the instructions, I started with the lower hull and suspension system. I also assembled the road wheels and glued them to the lower hull. I then assembled the transmission, the engine (26 pieces!) and the radiator. 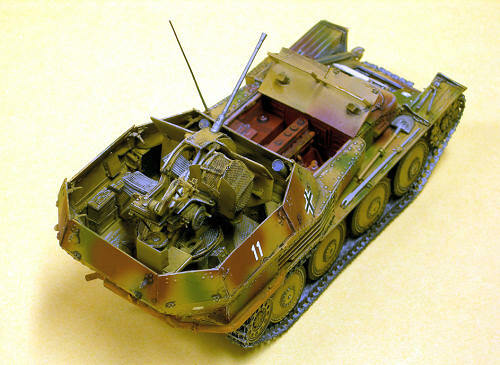 Once these were all assembled, I installed the engine and radiator in the engine compartment and the transmission with the drive shaft in the front of the lower hull. I also glued in the driver’s seat. The next subassembly was the upper hull. There are quite a few parts on each of these, so I tried to take my time and make sure that I didn’t miss anything. I like to glue the tools on the tank and then hand-paint them later. Right off the bat, the dreaded PE came into play. There are a myriad of latches, tie downs, and boxes that are PE. I don’t have one of the PE bending tools, but I would highly recommend one of these for this kit. As an example of the PE complexity, each of the tie downs for the tools such as the shovel, axe, and track tools consist of three very tiny PE parts. It is very easy to “cut bait and run” at this stage, if you get my drift. I next assembled the fighting compartment equipment. The radios alone consisted of 16 pieces. The gun base is a complex structure as well (about 12 parts). I had some trouble aligning the drive shaft that rotates the gun base, but fortunately, it’s difficult to see this error once everything is assembled. Step 13 is where I had the most trouble. I decided to build the kit with the gun shields in the “up” position, but for some reason, I just could not get the parts to line up correctly (perhaps due to mislabeling?). No matter how I tried them, the angles just would not match up. After several attempts, I decided the only alternative was to scratch-build my own shields with the correct angles. So I made some templates and cut out the parts from thin white plastic stock. 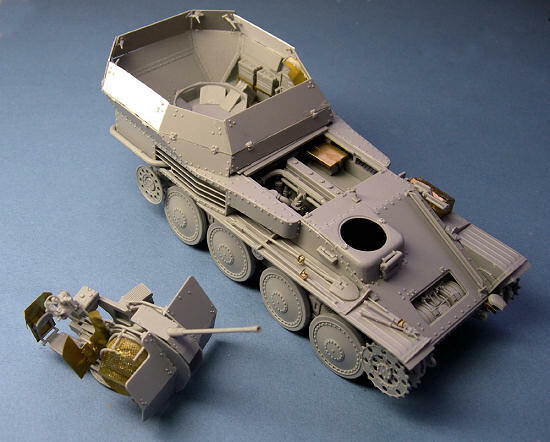 After surviving that trauma, I then moved on to the 2CM FLaK gun, which is a kit within this kit (in fact, you get all the pieces for Dragon’s 2CM FlaK 38, which is their kit No. 6288, along with all the PE parts included in that kit. You have the option of using either PE parts or plastic parts for the gun shield. The most difficult part of the gun assembly, but to me, the most striking when assembled, is the spent shell “cage” that was used to prevent ejected shells from flying all around the fighting compartment. While this is a neat part of the kit, it takes some doing to get it shaped correctly and mounted to its plastic frame. Another gun assembly option is the elevation angle: 0, 20, 40 or 60 degrees. Depending on which you choose, there are separate parts associated with each elevation angle. I opted for the 40-degree elevation angle. At this stage, I had put off the tracks as long as I could, so I finally faced the task of assembling these. I used methyl ethyl ketone (MEK) to glue the long straight lower sections of track, and then switched to regular plastic cement to build the sections of track that would bend around the drive sprockets. I then assembled the top tracks, trying to get the right amount of sag for a stopped vehicle. I ended up with about 5 separate sections of track for each side. After painting these, I later assembled them around the wheels and running gear on each side of the lower hull. I started by painting the interior compartments. From articles I have been able to read on the Internet, German armor engine compartments were painted red, so I opted for Floquil’s hull red. 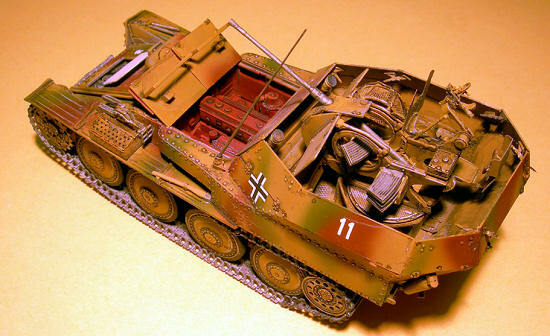 After painting the compartment, I placed the covers on it and then painted the vehicle’s exterior. I sprayed the transmission compartment flat white. For the exterior, I decided on a different paint scheme than the instructions offered. 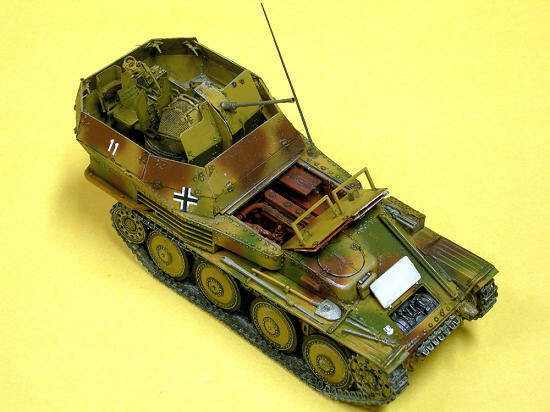 I started with MM Sand Gelb as the overall base coat, and then painted red brown and dark green splotches on the vehicle. I sprayed the tracks with Testors Steel. Once everything was dry, I coated the entire model with Future. I applied decals to the vehicle, and then applied a wash of Liquitex Ivory Black acrylic paint over everything, including the tracks. I used superglue to secure the track sections to the vehicle. I then used a small paintbrush and Model Master Wood paint to paint the handles on the axe and shovel. I painted the rest of the tools on the fenders with Testors Steel. Next, I dry brushed the vehicle with Polly S Fantasy Goblin Flesh to simulate rust (ever since Floquil stopped making their rust wash, I have found it difficult to locate a paint that actually looks like real rust. This fantasy paint is about as close as I have come lately). The final weathering was to take a silver artist’s pencil and rub it on sharp edges where there normally would be wear to simulate bare metal. This is yet another great kit from Dragon. I highly recommend this kit to all armor buffs, plus anybody that’s up for a modeling challenge! Thanks to your editor for the review kit.